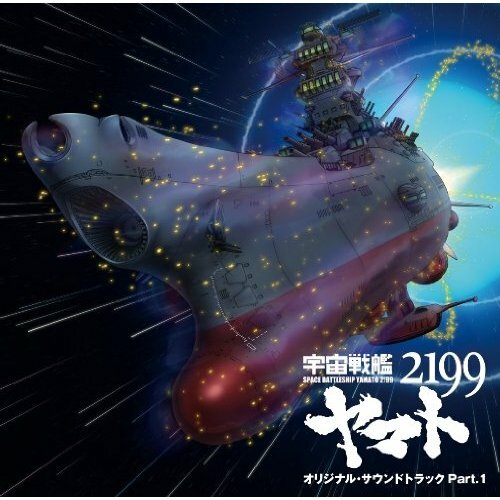 Review: Space Battleship Yamato 2199’s soundtrack starts its journey in the 1970s with Hiroshi Miyagawa’s stirring score and enters the postmodern era through Hiroshi’s son, Akira Miyagawa. In the course of its journey, the soundtrack retains a dignified air that inspires with its persistence but also bears warts from decades past. On the whole, consistency isn’t this album’s strong suit; at its best, Yamato 2199’s music is exhilarating as it propels the mood towards greater heights. At its worst however, the pieces drag, drawn out by bland discordance or worse, repetitiveness, that compels one to move on to greener pastures. Whether these faults are a result of relics past, one cannot say. But when it comes to Yamato 2199’s grandiose legacy, the opening leaves no doubts about it being alive and well. Despite having no associations with the original Yamato, I still found Isao Sasaki’s performance and the elder Miyahawa’s compositions enthralling through and through. Sasaki’s deep vocals and relentless, emphatic delivery capture the essence of this space odyssey, bestowing upon it an air of grandiosity to sweep me along. As it proceeds further, the piece becomes imbued by a singular purpose, one that sets its stamp upon the rest of this album as the crew of the Yamato gallantly push forward. Woe then, to those who aren’t fond of this motif because it will serve as a constant companion. As soon as the last notes of “Space Battleship Yamato” subside, the motif makes an emphatic return in “Yamato Ongoing,” where its structure and melody provides a contextual starting point. Here, the short brass fanfare does what’s expected: it instills excitement for the journey while the motif drives on with a repetitious air that isn’t unpleasant, but hardly amazing. The motif’s grim, melancholy implementation in “Pathetic Yamato” is slightly better, but trades subtlety for a heavy-handedness that plods ever closer towards a blaring doom. “Long-running Yamato’s Theme” is one of the few memorable variations as it channels a persistence that blossoms into an inspirational choral air to urge the crew onwards. Magnificent it may be, but it’s more the exception than the norm; the variations themselves, while sufficient for their contextual tasks, aren’t great examples of inspirational or heartfelt music. To actually marvel at the sheer scope of the anime, look to tracks like “The Universe Spread to Infinite” and “Galactic Route BG.” In the former, a light choral air with a melancholy tone evokes an aura of loneliness that matches the Yamato’s isolation from Earth, lending a sense of scale unto it all. The latter is where inspiration takes flight. Right away, the cello section draws upon its warm timbre to convey the vastness of space and evoke the noble mission that the Yamato has embarked upon. Add to that the uplifting woodwinds and you have a piece that elevates the spirit through a convincing delivery that nails the glory inherent in the Yamato’s mission. No discussion of inspirational fare is complete without mentioning the anthems. Of the two featured on this album, the de facto anthem for the Yamato, “Galactic Route” is my favorite. Drawing its melody from “Galactic Route BG,” the stirring delivery carries a pompousness meshed not only with unfettered enthusiasm for the journey, but also the Yamato crew’s unrelenting belief in their ability to save humanity. Not to be outdone, “Garmillan Anthem ‘Praise Our Light, Forever'” is similarly inspiring though its tone is more militaristic as it expresses a fervent desire for conquest through the grim, brassy swells that evoke a relentless march towards glory. Unfortunately, the Garmillan anthem and its two variations later on in the album are the best track to come out of the antagonists; everything else is either discordant, disjointed, or both. “Desler Appears,” the theme that plays when the camera focuses on the eponymous antagonist, is symptomatic of this discordance in that you have an electric guitar and piano accompaniment that are content to deliver a heavy dose of tension through their brief bursting snippets, but are presented in a disjointed way that it isn’t pleasing to the ears. “Red Star’s Suspense” falls into the same trap in that it’s not only disjointed, it’s also noisy as it crescendos into a fanfare that ends up going nowhere. So while the Garmillas-related tracks are unpleasant, the action tracks are arguably worse because their blaring delivery fails to be engaging. For example, “Desperate Situation” features a shrill violin section with some brassy bursts to highlight the dangers, but it does so without creating a narrative that would draw listeners into the piece. This cue-like execution plagues many other action tracks like “Seekers Takeoff” and “Moon Crater” which lack the flash and dazzle that you expect out of space battles. The former simply lets the lower brassy blares sound off while the latter is chaotic, but boringly repetitive. Suffice to say, these tracks are disappointing. While I wasn’t expecting action music on the caliber of Star Wars, or even Macross Frontier, I was hoping for music that is befitting of a space epic such as this. Looking back upon Space Battleship Yamato 2199’s legacy, I wonder if the musical decisions and their repetitiveness resulted from a desire to keep the anime’s music frozen in its past because so much that I found distasteful felt like relics that have been dredged up. Part of this suspicion comes from Akira Miyagawa’s past compositions which include the marvelous score to Emily of New Moon. What he presents in Yamato 2199 falls far short of the expectations I had set, so even if the momentous atmosphere of the 1970s original is undeniably present, it’s too bad that it wasn’t more consistent. I say the problem with this is that it can’t really function without the anime. You can’t separate them. However, paired with it and it’s quite the ride. The main theme is epic in scope and feel. The dirge at the beginning of the opening theme. Blaring horns as the Yamato leaves the atmosphere. ‘Desperate crisis’ works pretty decently during the Red October moments. I mean, by themselves, without context, no, they can’t really do much. But together, man, r magic happens. Retro-disco magic of space captains and cannons. Also, I cannot get the damn theme song out of my head. Seriously. It’s been a bloody month. I guess that’s not too much of a surprise since both father and son worked on the project and Akira Miyagawa was able to stay faithful to his father’s score. Without that nostalgia, I can really only rely on 2199 and that was pretty good for what it was.